This stator is in very good condition and shows normal signs of wear. This part is for: 1983 Kawasaki 750 LTD KZ750F Shaft. Removed From: 1981 Kawasaki KZ750E Standard. 1985 Kawasaki ZX750E Turbo. 1984 Kawasaki ZX750E Turbo. 1985 Kawasaki ZN700A Ltd. 1984 Kawasaki ZN700A Ltd. for superior selection & service! The Fatman makes deals! In 2003 we forged the unknown by growing online. This stator flywheel is in very good condition and shows normal signs of wear. This part is for: 1983 Kawasaki 750 LTD KZ750F Shaft. 1985 Kawasaki ZX750E Turbo. 1984 Kawasaki ZX750E Turbo. 1985 Kawasaki ZN700A Ltd. 1984 Kawasaki ZN700A Ltd. Made in the U.S.A. 1 year manufacturers warranty. This is a USED OEM Kawasaki stator magneto assembly that fits 84-85 ZN700 LTD and 84-85 ZX750 GPz. This stator has typical signs of previous use, but has been tested and is in good condition. All of the factory connections are intact. 1980 Kawasaki KZ750 LTD. Stator & Magneto. It has not been tested. The magneto and stator are both in good condition. Overall they are in good shape. Mileage: 19,186. Engine Serial Number: KZ750EE021734. Generator Stator For Kawasaki ZN 700 LTD Shaft / GPz 750 ZX750 1984 1985. Kawasaki ZN 700 LTD -- 1984-1985. If there is any doubt, have the battery load tested or replaced. Before installing your new stator. Removed From: 1982 Kawasaki 750 LTD KZ750H. The stator flywheel has light scratches. Removed From: 1981 Kawasaki 650 CSR KZ650H. 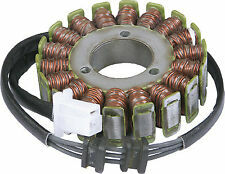 Stator For Kawasaki KZ 650 750 1980-1985. Kawasaki KZ 650 -- 1981-1983. Kawasaki KZ 750 -- 1981-1983. Kawasaki KZ 750 E 4 Cylindre Std 4 -- 1980. Kawasaki KZ 750 F1 LTD (4 cyl) -- 1983. Kawasaki KZ 750 LTD -- 1980-1984. New OEM Style Kawasaki Stator. In the event of product failure or defect, products are limited to the manufacturer warranty. Incorrect Item Received Any item that has been installed,used, or shows any signs of installation. ESG013 is a high quality stator that replaces the OEM stator in Kawasaki KZ650, KZ750 and ZX750 models. Part Number: ESG013. Part Number : ESG013. 1981-82 Kawasaki KZ650 CSR. 1980-83 Kawasaki KZ750E. 1985 Kawasaki ZX750A GPz. 1984 Kawasaki ZX750A GPz. 1983 Kawasaki ZX750A GPzts. 1983 Kawasaki KZ650H CSR. 1982 Kawasaki KZ650H CSR. 1981 Kawasaki KZ650H CSR. 1982 Kawasaki KZ750E. 1981 Kawasaki KZ750E. Scooters Performance - Fast shipping! MotoSmart # 117499. 1981 Kawasaki KZ750 (E2, H2, LTD) Stator. Used Stator removed from a 1981 Kawasaki KZ750 (E2, H2, LTD). Only the part(s) shown in the pictures are included. 81 1981 Kawasaki E2, H2, LTD KZ750 KZ 750 OEM Stator Alternator Generator Magneto Pick Up Coil Winding MotoSmart. Motorcycle 1984-1985 Kawasaki ZN700 LTD 700 1. Motorcycle 1984-1985 Kawasaki ZX750 Turbo 750 1. Starcycle USA has been serving the world's motorcyclists since 1968. Removed From: 1981 Kawasaki 750 LTD KZ750H. Kawasaki KZ200 1978 - 1979. Kawasaki KZ200A 1978 - 1979. Kawasaki KZ400 1978 - 1979. Kawasaki KZ400B 1978 - 1979. Kawasaki KZ650B 1978 - 1979. Kawasaki KZ650C Custom 1978 - 1979. Kawasaki KZ650D SR 1978 - 1979. Motorcycle 1983-1985 Kawasaki GPZ750 750 1. Motorcycle 1981-1983 Kawasaki KZ650H CSR 650 1. Motorcycle 1980-1982 Kawasaki KZ750B 745 1. Motorcycle 1980-1983 Kawasaki KZ750H LTD 750 1. Starcycle USA has been serving the world's motorcyclists since 1968. Kawasaki KZ1100 1983 - 1985. Kawasaki ZN1100B Ltd 1983 - 1985. Kawasaki VN700A Vulcan 1985. Kawasaki ZN700A Ltd 1984 - 1985. Kawasaki VN1500B Vulcan 88 SE 1987 - 1988. Kawasaki VN1500B Vulcan 88 SE 1990. MotoSmart # 117476. 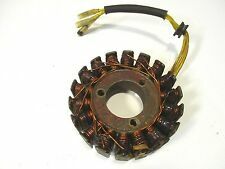 1980 Kawasaki KZ750 (E1, H1, LTD) Stator Flywheel. Used Stator Flywheel removed from a 1980 Kawasaki KZ750 (E1, H1, LTD). Only the part(s) shown in the pictures are included. 80 1980 Kawasaki E1, H1, LTD KZ750 KZ 750 OEM Stator Flywheel Magneto Generator Alternator Lighting Coil Rotor MotoSmart. Zn750 LTD Stator. This is the stator from an 84 zn750 LTD. In good used condition, works like it should or your money back. Electrosport Industries. 20% greater output than O.E.M. stator. We understand that such delays can be very inconvenient when they occur, but we do not have any influence over such situations. (unless otherwise noted). MotoSmart # 117510. 1981 Kawasaki KZ750 (E2, H2, LTD) Stator Flywheel. Used Stator Flywheel removed from a 1981 Kawasaki KZ750 (E2, H2, LTD). Only the part(s) shown in the pictures are included. 81 1981 Kawasaki E2, H2, LTD KZ750 KZ 750 OEM Stator Flywheel Magneto Generator Alternator Lighting Coil Rotor MotoSmart. Type : Stator. All parts are new and built to OEM specifications. Kawasaki KZ750R GPZ 1984. Kawasaki KZ750R GPZ 1985. Kawasaki KZ750H LTD 1980. Kawasaki KZ750H LTD 1981. Kawasaki KZ750H LTD 1982. Kawasaki KZ750H LTD 1983. Kawasaki ZN700A Ltd 1984 - 1985. Kawasaki ZX750E Turbo 1984 - 1985. Select models have a high-performance, heavy-duty Hot Shot series version made with a special Mosfet technology that does not get hot (as noted). RICKS STATOR KAWASAKI 21-238. Misc Body Parts Mirrors. Eyewear Clothing & Accessories. Engine Related Parts. Electrical and Lighting. Classic Picks. PRODUCT TYPEElectrical. MANUFACTURER PART NUMBER21-238. Full ONE YEAR Warranty from an Authorized Dealer!